Who is Moving to NH and Why Does it Matter? A lot of time and energy is expended fretting over young people and recent college graduates from New Hampshire moving to other states. It would be nice if many young people remained in the state but keeping a larger percentage of a shrinking demographic is, at best, a small part of New Hampshire’s longer-term demographic and economic challenges. 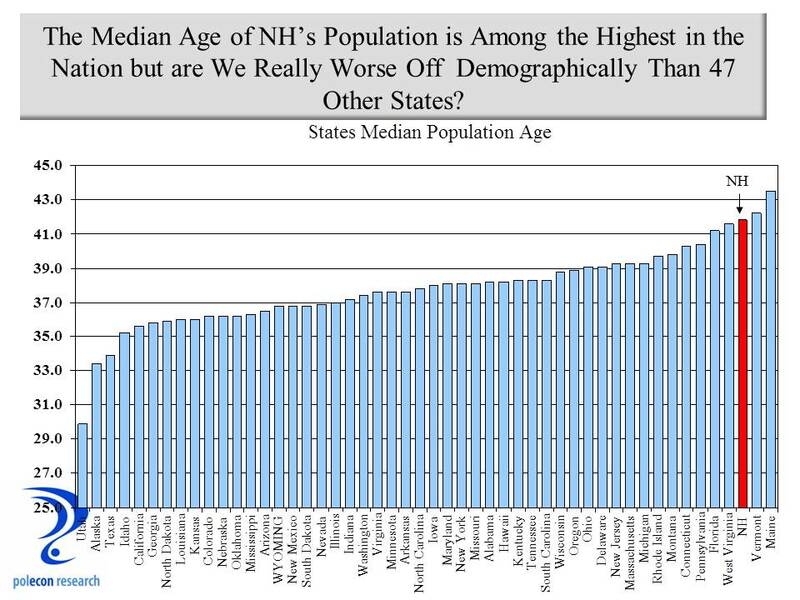 New Hampshire, along with the rest of Northern New England has been a net supplier of 18-24 year olds to other states for decades and it that hasn’t changed much in recent years. 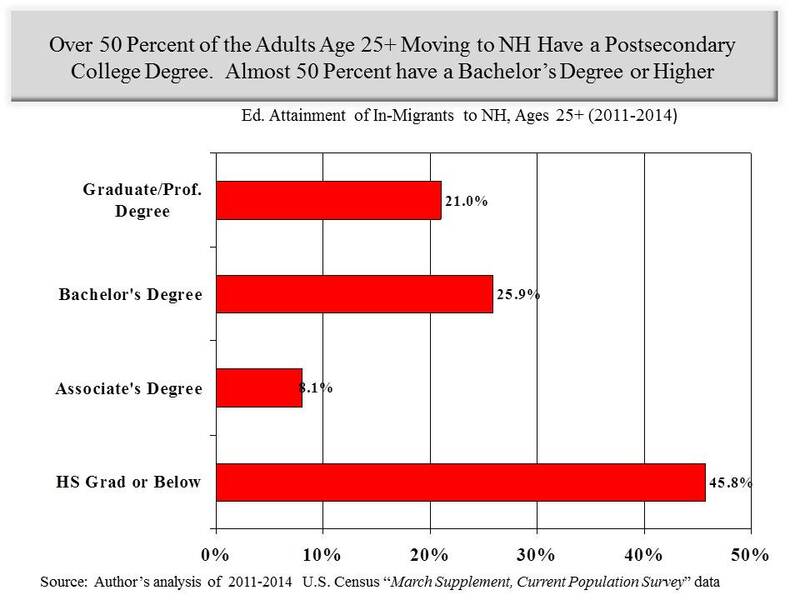 It isn’t exactly a trade but what NH got in return, that is until the mid-2000s to the mid-2010s, was a lot of 30-44 year olds with high levels of educational attainment. The movement of individuals and families into New Hampshire during their early and mid-career years was what set New Hampshire apart from the rest of New England and the Northeast and it is what provided the fuel for the extraordinary rise in prosperity in the state from the 1980s to the early 2000s. If NH becomes more attractive to young people that is great, but with the lure of several great and exciting cities so close, I don’t think our appeal to the youngest entrants to the working world is likely to be fundamental strength of our state. Still, I say go for it, it can’t hurt unless it takes our state’s “eye off the ball” of what contributed so greatly to our state’s prosperity. Take whatever actions to make our state a “hipper” place for young people as long as those actions also make NH even more attractive to those we have already proven we can attract and retain. Attempting to address whatever shortcomings NH has in the eyes of young people is a noble goal but no entity thrives for very long if it spends most of its time addressing its failures instead of feeding its successes. In this case, NH’s success is its demonstrated appeal to early and mid-career individuals and young families. 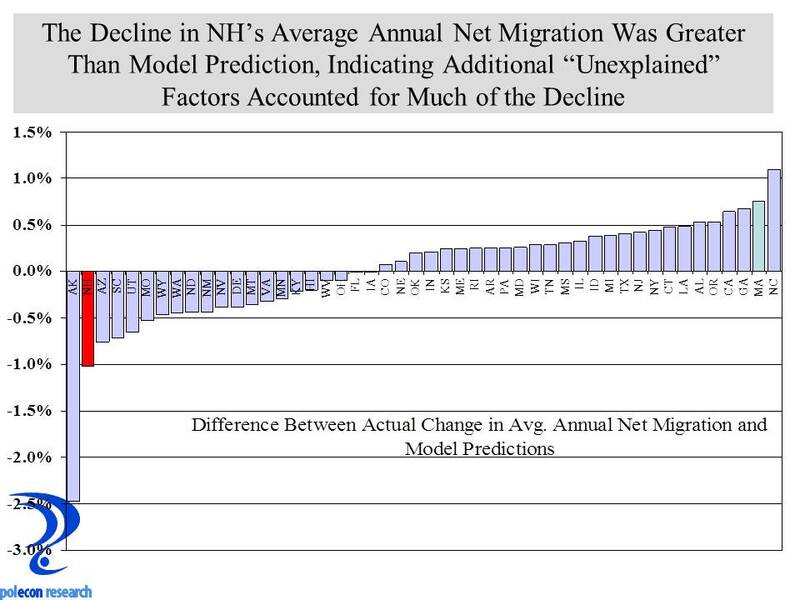 After a decade of limited net in-migration from other states (more people moving in than moving out) and even net-out migration, in-migration to NH from other states is once again rising. I confess to being a huge fan of the middle of the age distribution. Attracting those in the middle won’t give a state the lowest median age but it does help keep a state’s median age relatively stationary in the face of declining birth and mortality rates. More importantly, the benefits that individuals age 30-54 confer on an economy are much more important than are the benefits conferred by the 18-25 crowd. A younger workforce has been in favor since the 1980’s and capturing recent college grads is an obsession in NH and in many states, but in reality the strong economic growth that characterized the US and NH economies during much of the 80s and 90s, was, in part, the result of an increasingly high percentage of workers age 35-54, and a corresponding decline in the % age 20-34. In the aggregate, workers age 35-54 are our most productive. They have more accumulated expertise, knowledge and training than younger workers, at the same time they work more and are in their “peak” earning years. The high % of workers age 35-54 during the 1990s likely played a significant role in boosting our national and state productivity. The 35-54 age group works and earns earn more than older workers, boosting overall income levels and government revenues, at the same time this age group invests and saves more than the 20-34 age group, contributing to lower inflation and interest rates at the national level. 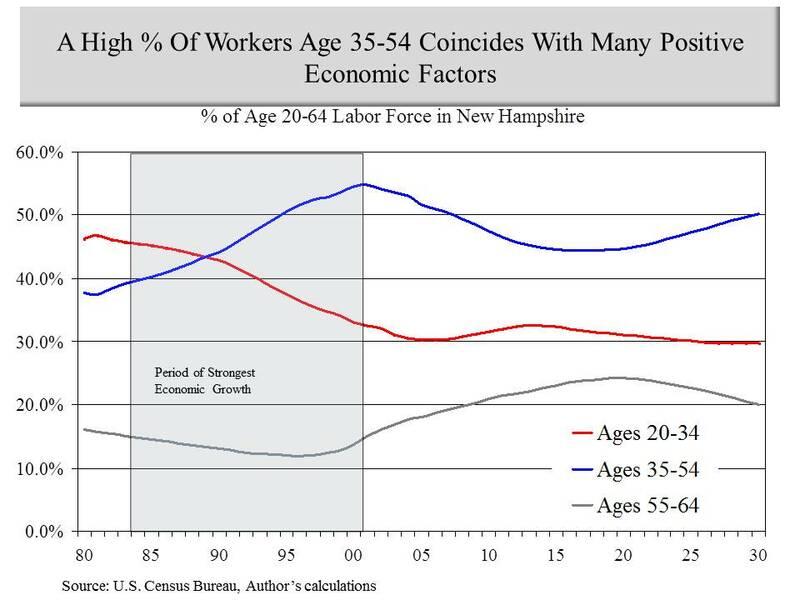 As the chart below shows, NH’s period of strongest economic growth (as well as the nation’s) coincides with an increasing % of workers age 35-54. So, as I hurtle relentlessly toward the dying of the light I say three cheers for middle-age and let’s hope NH keeps attracting skilled, well-educated individuals and families in their peak working and earning years. My analysis of the last five years of NH data from the Census Bureau’s “Current Population Survey” suggests that is what is happening, boosting the prospects for accelerating prosperity in NH along the way. 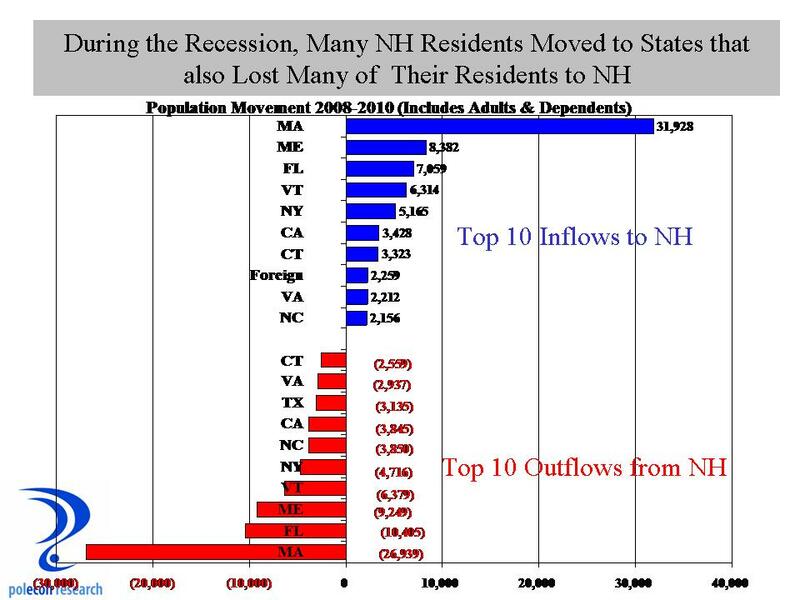 I examined the characteristic of some 22,000 individuals from the survey, over four years, who indicated that they had moved into NH during the prior 12 months period (I also examined the characteristics of those who moved out but that is another post). The age composition of in-migrants age 18 and older is presented in the chart below. 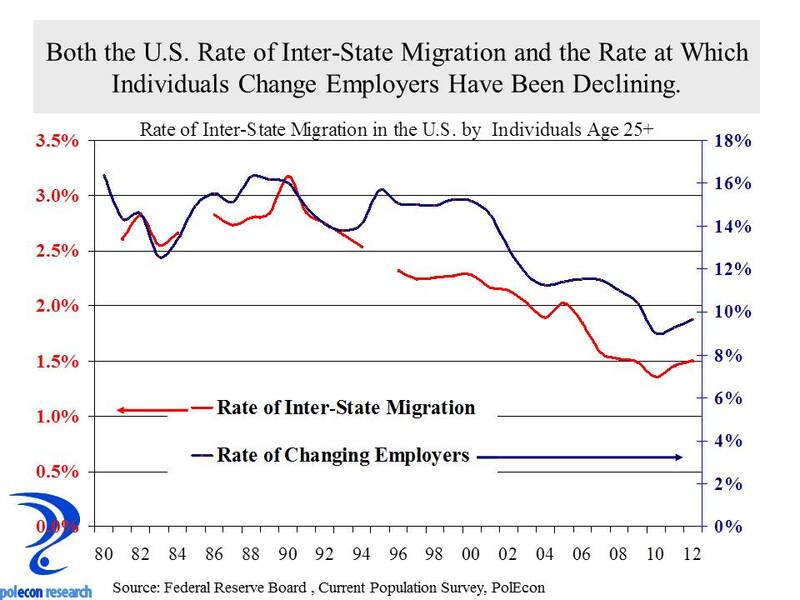 It shows that the largest group of in-migrants was ages 25-34, representing 44 percent of the adult age migration to NH during the 2011 to 2014 time period. Another 25 percent were in the larger age 35-54 age group. 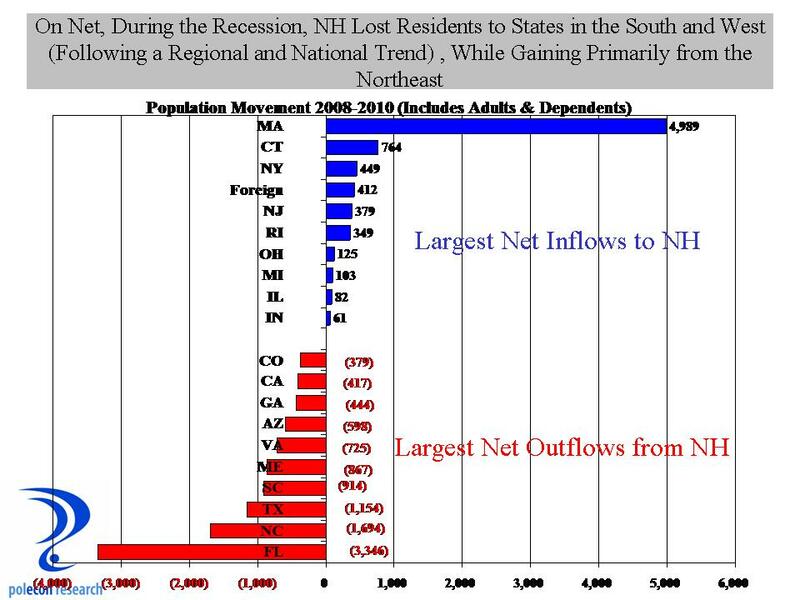 New Hampshire will do quite well thank you very much if it can attract more of these individuals than it loses to other states each year. 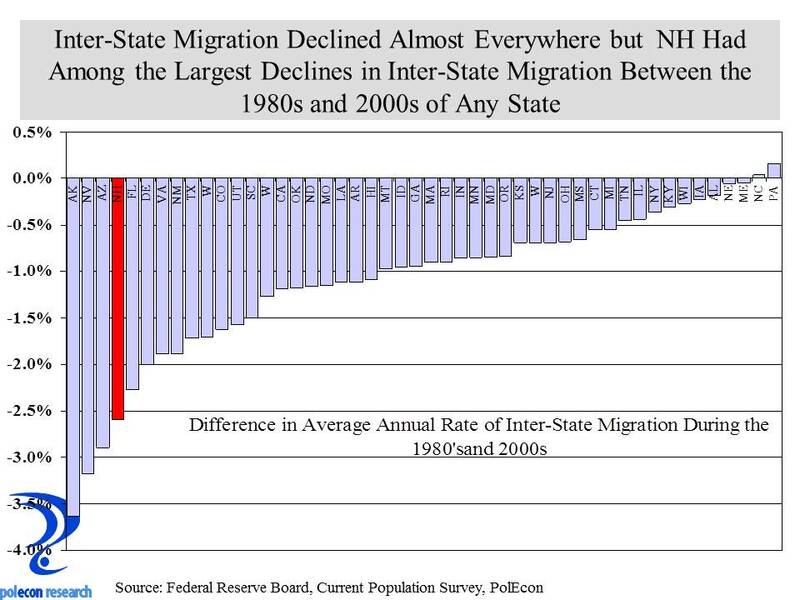 Net in-migration to NH resumed in 2013 and anecdotally appears to be accelerating in some parts of the state. As encouraging and important as the age composition is of in-migrants to NH is, the educational attainment of in-migrants is perhaps even more so. On that front there is even more encouraging news. About 55 percent of in-migrants age 25 and above hold a post secondary degree, with 47 percent holding a bachelor’s degree or higher. This is significantly higher levels of educational attainment than in the current population of NH residents age 25 and above. I am waging my own private campaign (with limited success) to keep three of NH’s best and brightest young people in our state. Efforts to attract well-educated, early career and middle-aged residents aren’t nearly as exciting as campaigns to entice the young and the restless to remain or migrate to New Hampshire, but they are likely to pay greater dividends over the long-term for New Hampshire.